Marcus Swanepoel, CEO and co-founder at Luno (formerly known as BitX), gives us some insight into the world of Bitcoin, why we should stand up and take notice and why he been so inspired to create a company that focuses on the growth and adoption of Bitcoin. At Luno we call this future a state of ‘frictionless money’. In our discussions with banks, fintech companies and regulators, there appears to largely be a consensus about what this future might look like. The areas where there is sometimes disagreement is how we will get to this future, and how long it will take. There are of course many ways to get to this final outcome. This includes building some form of ‘challenger bank’, existing banks changing their structure or approach, fintech companies broadening away from their niches, or even Facebook or Google trying to dominate the space in their own way. That all said, we believe that decentralised digital currencies, and in particular Bitcoin, will be a key enabler for this future and is in all likelihood the best way to get there, and also get there the fastest. We call the first phase ‘bridging the old and the new’. This is where people access digital currencies for the first time, either by earning it through work or mining or converting their existing local currencies to new digital currencies. Once there is a critical mass of users we will see an acceleration in ‘enabling ecosystems’ — more people, businesses and even devices (i.e. internet of things) willing and able to transact using digital currencies. Later in this article, we explore later the forces that are already driving adoption to this tipping point and fast. These broader ecosystems will continue to drive adoption and finally culminate into the third phase of ‘making money frictionless’ — this is the phase that where people are now able to do things with money they otherwise wouldn’t have been able to do, and where money, as we know it today, has undergone a complete transformation. The first phase’s biggest pain point is that despite all the progress that has been made over the past few years, it is still relatively difficult to access, use or safely store digital currency. This is the problem that companies like Luno are currently solving. But make no mistake — while it might appear as if we are just a company that makes it easy to ‘buy and sell Bitcoin’, this is just a means to an end — what we are really doing is building this financial future and ‘making money frictionless’ — our long-term vision from day one. While we and many other Bitcoin companies are actually fundamentally digital currency agnostic, Luno is currently very focused on Bitcoin, purely because there is no other digital currency that is as safe and widely used at this time. If you asked us two years ago which digital currency would ‘win’ we would have said ‘something like Bitcoin, but only better’. But after witnessing Bitcoin’s strong networks effects in action and seeing the data, it would be very hard to see any other digital currency replace Bitcoin in its current form anytime soon. More on these network effects later in this article. And what about ‘blockchain’? We’ve written extensively on why we think that most ‘blockchain’ initiatives are bound to fail. In short, a lack of interoperability, solving for technical issues when the problems are human ones, inadequate trust mechanisms and simply because databases tend to do the job much better; and on a weekly basis, we’re seeing more and more data to back up our initial hypotheses. For better or worse, the best use case for a ‘blockchain’ is still a decentralised digital currency like Bitcoin. Nope, it’s growing. And fast. 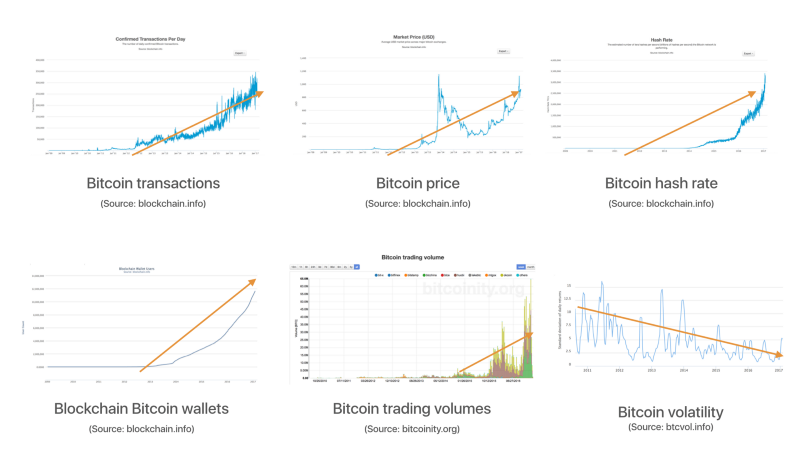 While the market is still small, there is an undeniable strong and growing demand for digital currencies like Bitcoin. If you look across all industry metrics that are publicly available, from transactions to conversion volumes to wallets, you’ll see that forward momentum. We also see the same trends (if not better) in metrics within our own business, across multiple countries and continents. When most people see this market traction there are typically two questions that jump out: firstly, who are all these people using Bitcoin (and what are they using it for)? 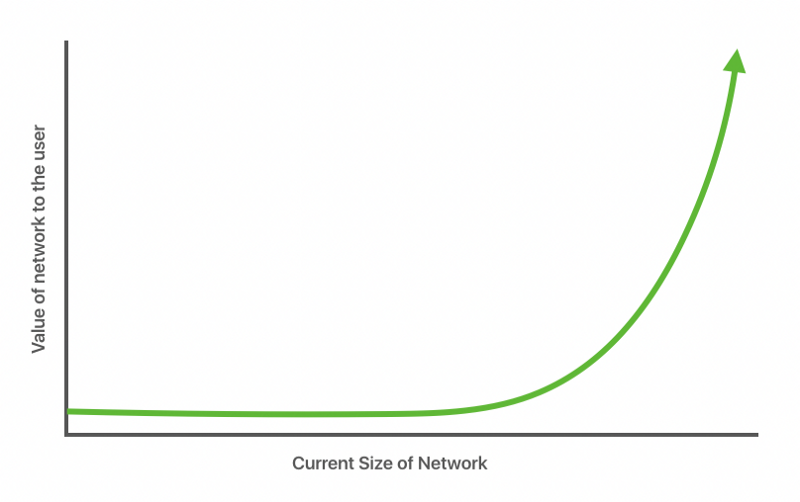 And second, the growth appears linear, but is linear growth enough to drive large-scale adoption within a reasonable timeframe? On the question about who uses Bitcoin — we broadly categorise users on a spectrum between two categories: need and greed. ‘Need’ customers are the ones that typically use Bitcoin because it allows them to do something they otherwise would not be able to do with the traditional financial system, or at least provide a compelling alternative. The uses vary widely but include things like cross-border e-commerce (no or rejected credit cards), cross-border payments (faster or cheaper in some very specific cases, especially for people in emerging markets), people who’ve been subjected to identity theft and want more security, a need for more privacy (not for illegal use, more an ideology), and sometimes simply because it’s a better user experience, especially for mobile payments. ‘Greed’ customers include active traders that speculate on price fluctuations as well as long-term speculators or novelty buyers hoping for the value of Bitcoin to increase in the long run. Somewhere in between the need and the greed we are also starting to see the rise of more sophisticated users that are buying Bitcoin because they consider it an uncorrelated asset and want to add it to diversify their portfolio, as well as long-term investors that are buying based on better thought out fundamentals and because they see it as a real alternative asset class that can potentially provide superior long-term returns. This includes both people that consider Bitcoin as a kind of digital gold based on its limited supply, as well as people that see it as a form of investment in a payment system like Visa (and the more people use Bitcoin in transactions, the more valuable this payment system and by extension the Bitcoin they hold become). A lot of this thinking is driven by a better understanding of how Bitcoin works as well as new data that has been published in the market that shows Bitcoin as one of the best-performing currencies in the world over the past few years, that returns are uncorrelated with many other asset classes, and that Bitcoin also has some of the best risk-adjusted returns in the financial industry. When we started our company, we initially didn’t like the ‘greed’ customers — we were obsessed with only wanting people to use Bitcoin for ‘real needs’ and use cases. But as our views matured, we realised two things — one, there is no Bitcoin killer app — Bitcoin itself is the ‘killer app’. It’s like asking what is the killer app of money — nothing, it’s just a means of value protection and exchange (over distance and time), and Bitcoin is just a more efficient mechanism for this. We also realised that ‘greed’ helps to build liquidity for the system (similar to how forex markets work) and that it was needed for many other parts to function and get built on. More importantly, ‘greed’ also accelerates network effects in a way that is very specific to Bitcoin, but more on that later. Is linear growth enough? Yes! So if we’re experiencing exponential growth, linear growth is exactly what it must look like in the beginning — it’s behaving just as it should. And we’ve seen this with many other technology explosions like smartphone and television adoption. It’s the same reason why technology is almost always adopted a lot faster than what most people think — they project the future on the linear past when it’s in fact exponential. 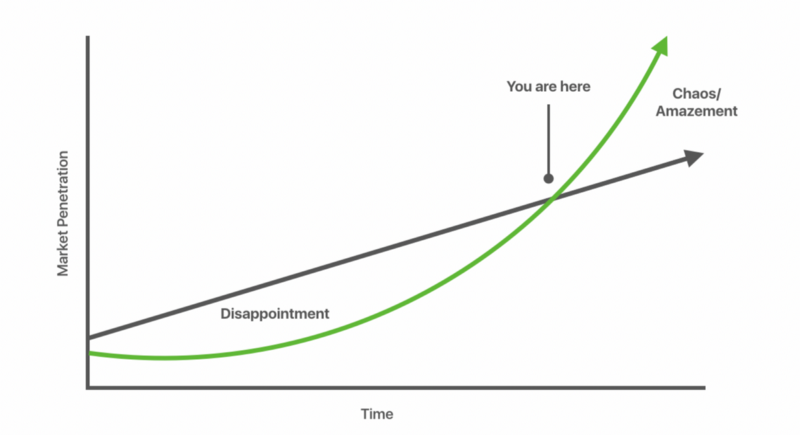 So how do we know that we’re on an exponential growth curve? Because Bitcoin has massive network effects. In very basic terms this just means the more people use it, the more useful it becomes to others, and the more likely they are to use it too. Remember when you didn’t use email because no-one else had email? And then at some point, enough people had an email to make it useful, so you also got an email address. Or Facebook — with no friends on Facebook it makes no sense to join until there are a few of your friends on it and you feel compelled to do so as well. Once you hit that critical mass, growth explodes and becomes exponential. Source: Fred Wilson / Fred Ehrsam Bitcoin has these same characteristics — it both makes intuitive sense and we’ve seen it in our data — the more people share Bitcoin the more others are likely to share too. 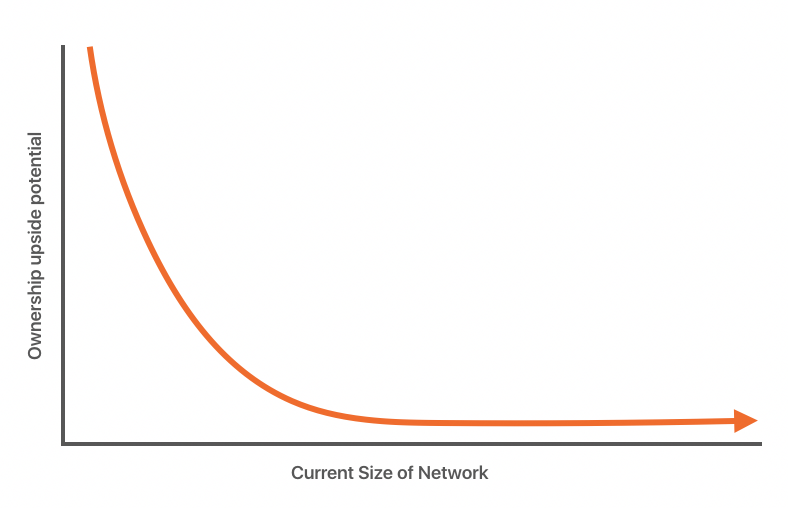 But like everything else that has network effects, there is a problem: the classic ‘chicken and egg’ — people will join, but only if there are enough people who have already joined, but they will only join if there are already others who have joined and so on. So how have other companies overcome this obstacle? Either make products that are extremely useful and sticky, like Slack, or for products that have higher barriers to entry and that people don’t use as regularly, simply pay them. Paypal did it. Why would anyone use Paypal if no-one else is using Paypal? Paypal literally started paying money into people’s bank accounts to get them to use the system. Yes, they were successful for other reasons too but this really kickstarted it all. Uber does the same thing in a way — it wants more people to join Uber so that more drivers join so that more people join, a classic two-sided marketplace. And they do it by paying you, the user. Not in cash, but by giving massive discounts. By some accounts the average Uber discounts today are close to 60%, so people are in some sense not joining Uber because it is useful, they are joining because the Uber shareholders have ‘paid’ them for potentially more than half the cost of the ride. So are we going to start paying our users to start using Bitcoin? No, we don’t have to. That is the genius of the design of Bitcoin. Bitcoin (and many other digital currencies for that matter) has another type of adoption curve built into it, but this one focuses on ownership potential rather than the usefulness of the system. Coinbase’s Fred Ersham wrote about this in his observations around ‘appcoins’, but it is just as true and arguably even more powerful for Bitcoin. Source: Fred Wilson / Fred Ehrsam In short, what this means is that the earlier a person ‘gets into Bitcoin’, the more economic upside (i.e. money to be made’) there is for them. This can be either through Bitcoin mining or just buying Bitcoin. 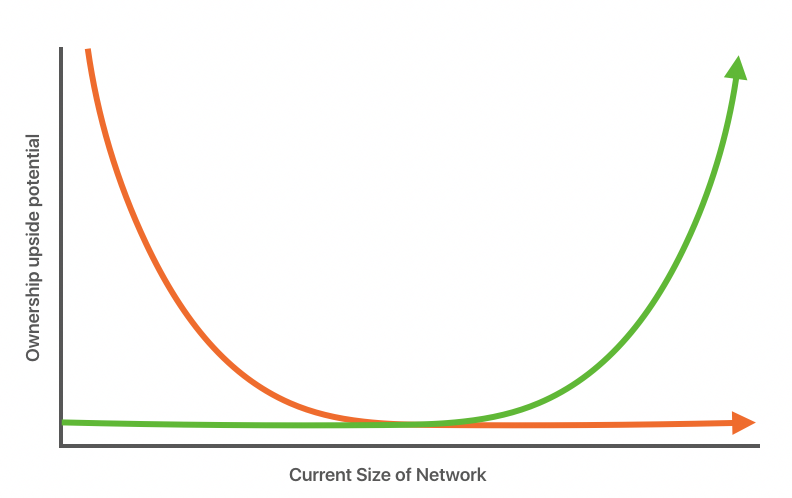 As more people join the Bitcoin network, the network itself becomes more valuable, and therefore the price of Bitcoin should (in theory) go up, giving those early adopters a financial return for risking their money early on to help the system get kickstarted. This works in a similar way to equity in a company where the early investors get more upside potential than the later ones, but of course, also assume more risk. When you combine these curves you get something that is unlike any other incentive and propelling system the world has ever seen. These forces can help drive adoption forward to an inflexion point where exponential growth and extremely fast rates of adoption kicks in. In the end, you have people joining for both greed and need, but over time the mix changes: early adopters join mostly for the economic upside (i.e. owning Bitcoin), later ones because the system itself (i.e. using Bitcoin) is valuable. The important takeaway is that these forces work together and are both necessary and important. Increased institutional participation — there are already some hedge funds publicly taking large positions in Bitcoin, and we’ve also had a massive uptick in enquiries from everything from hedge funds to private wealth managers and other financial institutions. The ‘serious’ money hasn’t even began to start playing in this space, and it is poised to happen. Can you imagine what would happen if just one sovereign wealth fund had to take even just a small position in Bitcoin? Further softening of global financial markets — it appears that the world economy is continuing to deteriorate, with many influential people openly starting to challenge everything from traditional economics to the role of central banks and the nature of money itself. As this accelerates we will see more interest in alternatives like Bitcoin. So maybe there is an opportunity for Bitcoin, but how big is it really? No one knows for sure, and it will depend a lot on what Bitcoin is ultimately used for. But we’ve seen estimates ranging from USD500 billion to USD10 trillion. Whichever way you look at it, even if Bitcoin just impacts 1% of traditional financial markets or financial systems, the opportunity is huge. Marcus has a deep knowledge of finance and fin tech with his background private equity, consumer and investment banking working at firms like Morgan Stanley and Standard Charted Bank. His experience spans across Europe, South East Asia, US and Africa. He has now turned over new chapter start-up founder with Luno and is now helping to build the future of money with Bitcoin/blockchain.